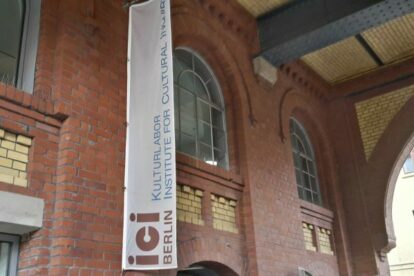 ICI Berlin – Learn about culture(s) – for free! One of the most fascinating things about Berlin is seeing how different cultures mix and interact. As culture is also a huge part of my studies, I am always looking for opportunities to add some theoretical background to my practical experiences in Berlin and elsewhere. ICI Berlin is one of the places I like to visit for this purpose. ICI stands for “Institute for Cultural Inquiry” which is a pretty accurate description of what they do. Researchers at this think tank explore the “productive confrontation of cultures”. Culture is interpreted in various ways; that’s why their lectures and conferences cover a variety of topics. I have been to a lecture on Islam in Europe, for example; another one was on the cultural representation of serial killers. These events are in English, open to public and always free of charge. ICI Berlin is located in a very nice former brewery site, the Pfefferberg area. This area can seem a bit like a labyrinth: The first time I came to visit ICI Berlin, I walked around for about twenty minutes. I definitely recommend using the map on their website. There are two ways: either you enter from Christinenstraße and just turn left. This is the easier one. Or, if coming from Senefelder Platz station, take the stairs up to the Pfefferberg area (next to restaurant “Tauro”) and make sure to consult that map. In any case, look out for the ICI Berlin flag on the picture, which marks the entrance.